Last night, I went to see a screening of The Lord God Bird, a movie produced and directed by George Butler of Pumping Iron Fame. The event was co-hosted by the Cornell Lab of Ornithology and The Nature Conservancy. I really enjoyed seeing it, although I don’t feel strongly about whether or not the Ivory Billed Woodpecker is alive or extinct. If it can be a symbol for the importance of conservation, then that’s great, but the important thing is that unique habitats are disappearing and we are leaving the earth in horrifically bad condition. John Fitzpatrick, the Director of the Cornell Lab and Scott Simon, the State Director of the Arkansas Chapter of The Nature Conservancy (hosted by my State Director) were there and answered questions at the end with the producers and U.S. Fish and Wildlife personnel. My favorite parts of the movie: Nancy Tanner (what a pistol), photos of a baby IBW, learning about the methods scientists are using to survey likely habitats for IBW. The theme song for the movie was written by Sufjan Stevens originally for the NPR story on the original “re-discovery” of the bird in 2004. You can listen to it here and read about it here. 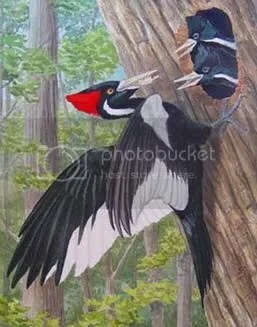 I saw a Pileated woodpecker a few weeks ago at FDR State Park near Columbus, Georgia and although they are not the least bit rare, I can honestly say my reaction was, “Lord God! Look at that bird!” And the IBW is supposed to be much more impressive. This project visually examines these vast and bizarre measures of our society, in large intricately detailed prints assembled from thousands of smaller photographs. Employing themes such as the near versus the far, and the one versus the many, I hope to raise some questions about the role of the individual in a society that is increasingly enormous, incomprehensible, and overwhelming. 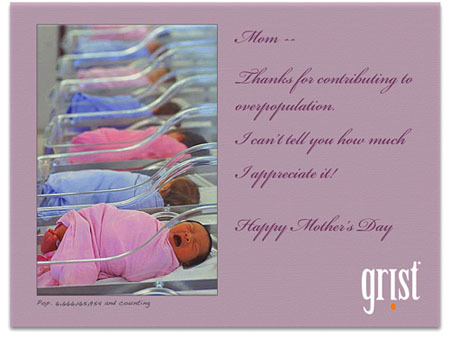 You may or may not wish to send your mom this Mother’s Day card from GRIST, depending on her sense of humor and sensibilities…. If you have not yet seen The Story of Stuff by Annie Leonard, I highly recommend it. It’s a clever 20-minute video about the production/consumption/disposal cycle and what it is doing to the earth and to people. A la An Inconvenient Truth, you can sign up to host a screening (some schools have done this and posted their experiences) – my daughter loves to watch it and discuss how we can contribute less to the Golden Arrow.Watch a snippet here, and then click on the link above to visit Annie’s site.